Is your business model fit for the Fourth Industrial Revolution? All aspects of Amazon’s business, such as its acquisition of Whole Foods, support each other. As the Fourth Industrial Revolution becomes ever more pervasive, we have good and bad news for leaders of incumbent businesses in all sectors and all geographies. We spent a large part of last year analysing the performance of the business models of the world’s leading companies. By “business model” we mean the overall, interdependent system by which an organization creates value for customers and captures value for itself. This includes its propositions, products, resources, processes, revenue streams and cost structures. The bad news first: there is an urgent need to transform traditional business models. The good news: there are ways of slicing up this seemingly elephantine task into bite-sized chunks. In this article we provide a 10-point checklist for doing so, including one action that is proving particularly effective in fast-tracking the necessary change. ⦁ Fewer than 10% of companies’ business models are economically viable as the world digitalises. Private surveys of CEOs confirm this sentiment. ⦁ The most successful business model today – in terms of customer value, revenue growth rates and market valuation – is the digital platform business model. Seventy percent of the world’s top 10 most valuable companies (Amazon, Apple, Alibaba, Microsoft et al) and 70% of the $1 billion+ “Unicorn” startups (Didi, Airbnb et al) operate this model, yet fewer than 2% of other companies do. 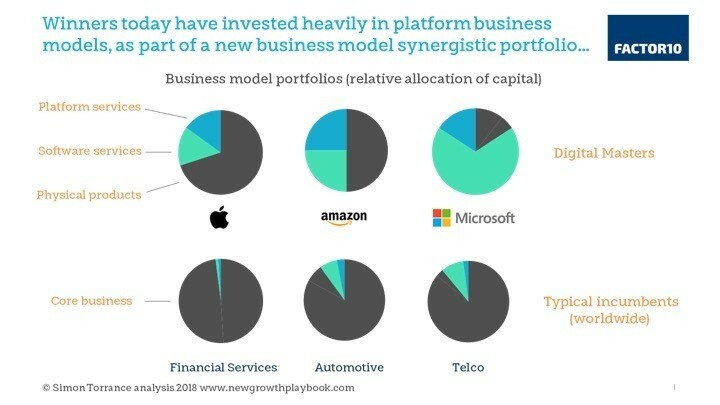 ⦁ Digital platform business models are forecast to mediate up to 30% of global economic activity by 2030, yet fewer than 5% of traditional companies have a coherent platform strategy that is integrated with their corporate strategy. ⦁ On average, fewer than 10% of the board members of incumbent organizations fully understand the economics of digital platform business models. ⦁ Incumbents in all sectors are investing more and more in digital – to keep up with customer demand and increased competition (not least from platform players) – but fewer than 15% of those companies are seeing any financial return at all on their digital investments. Internal innovation efforts, hackathons, accelerators and incubators are not proving successful enough in improving performance today. ⦁ As a result, the vast majority of leaders today lack confidence that their organizations are ready to harness the changes associated with the Fourth Industrial Revolution. Clearly, the imperative to transform incumbent business models and be able to compete effectively in a hyperconnected world has never been stronger. But transforming what is an interdependent system of people, processes and technologies, a complex mix of tangible and intangible assets that have been optimized to serve customers and deliver returns to shareholders in a certain way over many years is not easy. The good news is that there are 10 steps that leaders can take. None of them is easy, but we have found that the last one helps fast-track the achievement of the others. 1. Do your Board and Executive Team fully understand the economics of digital platform business models? Many leaders today don’t know what they don’t know. Digital platforms are a relatively new phenomenon and few have experience of operating them. 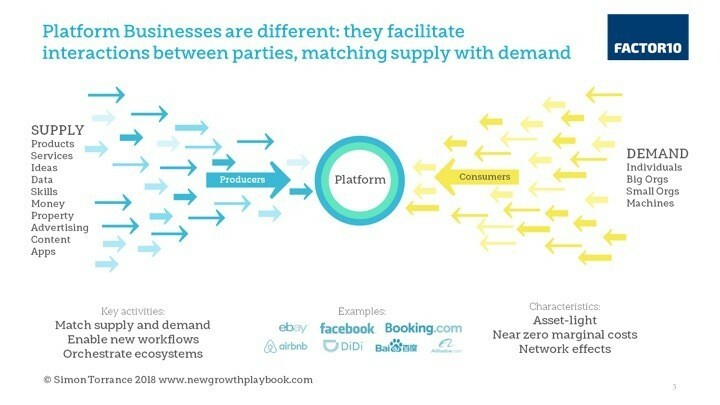 If platforms are likely to mediate 30% of global economic activity by 2030, everyone should understand how they operate so they can be clearer how to copy, compete or collaborate with them. It’s time to rapidly and thoroughly re-educate all leaders. Few organizations have done so. 2. Do you have a bold platform strategy in place, integrated into your corporate and digital strategy? Once leaders understand the new opportunities and threats, they can properly include platform thinking into their corporate growth strategy. This will require careful engagement of and communication with shareholders. Five years ago, Chinese company PingAn said it was no longer an insurance company, it was a “technology company with financial services licenses”. It executed on a platform strategy and is now worth considerably more than its erstwhile competitors. 3. Have you reallocated at least 10% of your capital and resources to platform business models? Time to put your money where your mouth is and properly invest in business models that deliver better value for all stakeholders. Today, most companies have tinkered with digital experiments and arms-length investments. Capital reallocation is the best way of turning strategy into reality. Wal-Mart recently made bold moves to compete by investing heavily in acquiring platform businesses Jet.com and Flipkart. Naspers, a 100-year-old South African publisher, invested $33 million in platform business Tencent, a stake worth over $100 billion today. Based on this experience, it then invested in creating and operating its own digital platform businesses, worth far more than its traditional publishing operations. 4. Have you created a synergistic portfolio of old and new business models? Amazon became so powerful by redesigning its whole business “system” with platform thinking. All aspects of its business support and reinforce each other. Buying Whole Foods not only created a new way of deepening relationships with certain consumers, it also created a new, internal customer for Amazon’s Web Services division (AWS). AWS’s Internet of Things marketplace drives innovations for its smart home device business, which drives demand for its e-commerce services. 5. Have you re-conceived your company’s purpose for the 4IR? 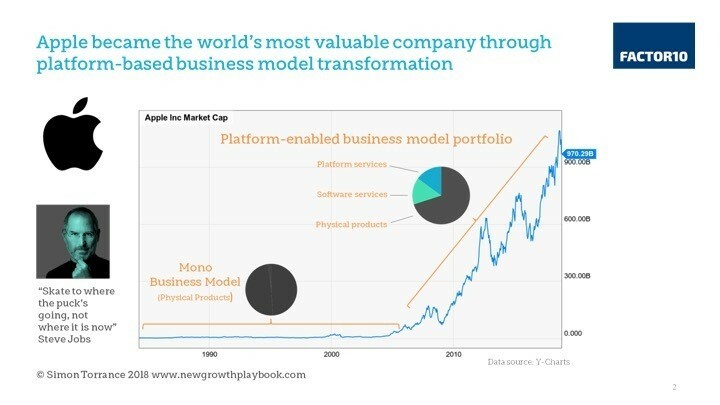 Platform business models enable organizations to serve customers without having to invest in traditional assets; they focus on facilitating high value interactions between multiple parties (Airbnb owns no property, Facebook develops no content, developers create apps for Apple). This changes the potential scope of what an organization can achieve, and the speed. Are you a “manufacturer of medical equipment”, or is your purpose to cure cancer by orchestrating an ecosystem of actors to do so? Uber’s purpose is to “move people from A to B”. It competes with car manufacturers but makes no cars. 6. Are your leaders open to cannibalizing parts of your core business? Enabling third parties to serve your customers is often counterintuitive for businesses. Schibsted, a Norwegian media company, invested heavily in online marketplaces which seemingly would cannibalize its traditional classifieds business. Instead it helped them create a new digital business, on a global scale, worth far more than their previously local and asset-heavy business model. Steve Jobs was originally against allowing others to create apps for the iPhone. If he had prevailed Apple would not have become the world’s most valuable company. 7. Does your organization have pervasive competence in software, data, AI? In his new book Smart Business, Ming Zeng, the Chief Strategy Officer of Alibaba, describes how the company invests heavily in optimizing all activity with software, data and machine learning: using algorithms to optimize every exchange, replicating human decision-making with software, and letting data flow inside and outside the organization via APIs and standards. The aim is for most operational decisions to be made by machines, so the company can adapt more rapidly to market demand. Skills in these areas are in short supply today of course, but the returns are significant if you can attract them. 8. Have you created new metrics to guide your business? Often company metrics are short-term and backward looking. They focus on measuring the success of the dominant existing business model but not on enabling new business models. Digital platforms often take three years to take shape, five years to get traction, and eight years to achieve critical mass. Traditional CFOs (and shareholders) are not used to the success drivers of powerful digital business models like these, so understanding the new types of metrics is critical. 9. Do you have a truly “ambidextrous organization” in place: with different units focused on “optimizing the legacy” and “inventing the future”, holding equal power and status? Building on the last point, it takes a long time to transform a legacy business model, due to cultural barriers, entrenched organizational structures and, of course, existing metrics. Few organizations have leaders with the combination of vision, digital expertise and personal power of Jeff Bezos to drive fundamental change down from the top within an incumbent business. Best practice today is not to try to fight against natural human resistance to change. Better to bypass it. While the core business is being optimized, invest in a separate business unit with the power to invent the future with new business models, new metrics, new people. Crucially it must report directly to the CEO and not be trapped within an “innovation unit” inside the legacy organization. It needs oxygen, resources and power to breathe and succeed. 10. Are you leveraging proven tech entrepreneurs to build new digital ventures in areas that are strategically relevant to your business? And finally, a step which shouldn’t really be last – it can and should be implemented first, in parallel with the others. If the definition of innovation is the process of taking ideas from inception to impact, and the impact you are looking for is 10x rather than 10%, then the method we have found most successful in catalyzing this level of value creation and transformation for a traditional corporate is to partner with proven tech entrepreneurs within a joint venture (JV) vehicle to rapidly grab new market opportunities. Entrepreneurs are unlikely to want to work directly for an incumbent corporate, but they value their assets (customers, cash, IP, networks). So, incentivized by an equity-based JV structure, entrepreneurs can leverage these assets to rapidly grab new, strategically relevant market opportunities before others do. If the vehicle is designed effectively, in a way that reduces corporate risk and enables a level of control, it becomes a win-win-win: for the corporate (to mitigate disruption and transfer knowledge), its shareholders (to generate new value) and for the growing network of successful tech entrepreneurs looking for their next opportunity (without having to deal with rapacious VCs).